Good evening! I had some time today to put together a few Halloween cards. I was trying to use up some of my paper scraps and sometimes that forces me to come up with some new layouts. 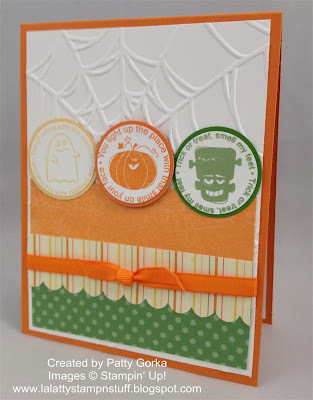 I hope you like my Halloween cards! 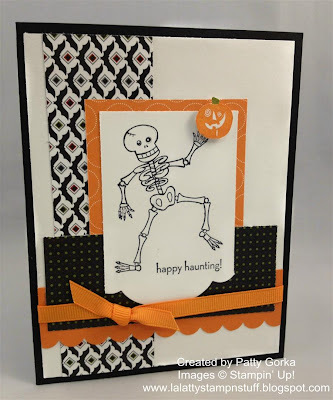 I had a scrap die from the labels framelits and I decided to stamp my skeleton image on that scrap piece of card stock and then I decided to cut straight around the top and both sides, but I left the bottom untouched which is why the bottom portion of my main image panel has the border from the framelit die. My pumpkin was stamped using old olive ink and then stamped again using pumpkin pie ink. I cut out both pumpkins, but on the orange layer I cut off the stem and then I placed that over top of my green stamped pumpkin- that gave me my pumpkin with the green stem. You could use your SU markers, but sometimes it looks nicer to stamp your images. 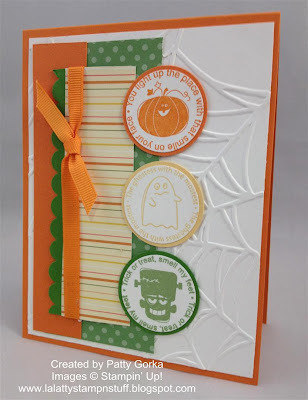 The bottom of my pumpkin pie card stock was punched using my scallop border punch and the rest of my card was just a matter of assembling it. There is a dimensional under the pumpkin image. 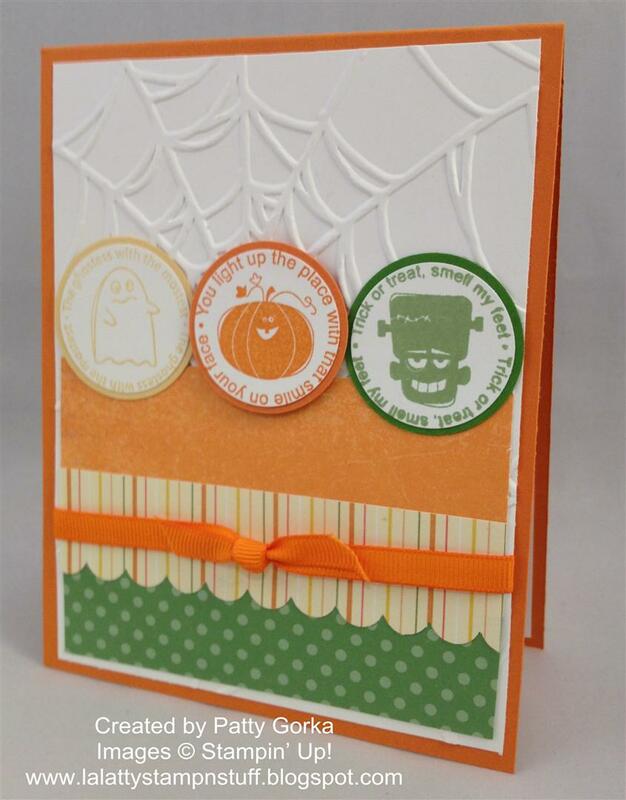 I made my pumpkin on this card the same way and I did on my card above. Again, on this card I was trying to use up some paper scraps that I had. For my embellishment I decided to use a clear bitty button and behind it I placed a punched out circle of cajun craze card stock. I sometimes do that when I don't have a button the exact color that I need. I then wrapped some white twine around my basic gray card stock and then I finished it off by tying it with a bow. I have dimensionals under my skeleton layer. 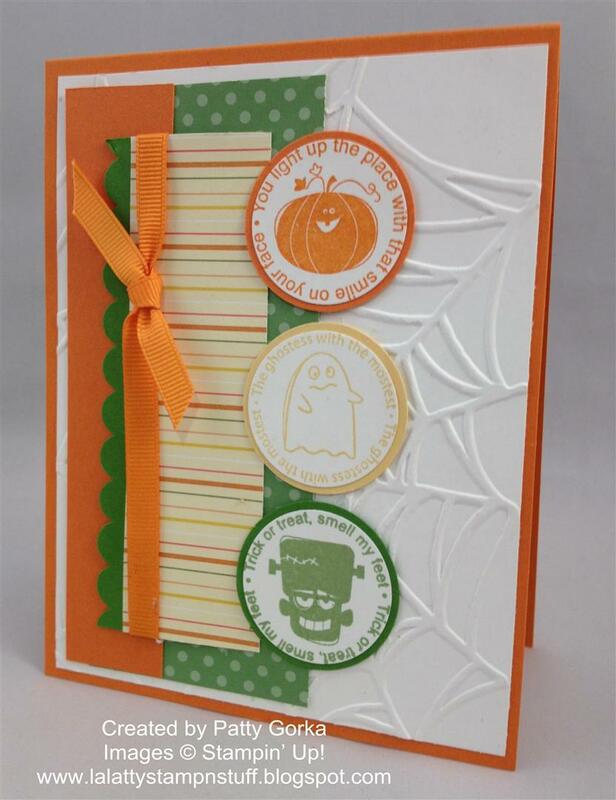 My background on this card is embossed using my big shot and my spider web embossing folder. Again, here I was trying to use up some paper scraps. I'm not sure I would normally use these colors together, but I think it works for Halloween. My images were stamped and punched out using my circle punches and I used my scallop border punch along the edge of my wild wasabi card stock towards the left hand side of my card. That's about it for this card, super quick and easy! Again, with this card my images were stamped and punched out using my circle punches. I was trying to use up some more scraps on this card too. I like the mix of designer series papers on this card. My center image (the pumpkin) is adhered using dimensionals. The bottom portion of my striped designer series paper was punched using my scallop border punch. Thanks so much for stopping by! I hope you had a great day! Oh my gosh Patty, I just love all 4 of them! Super great and awesome cards!! 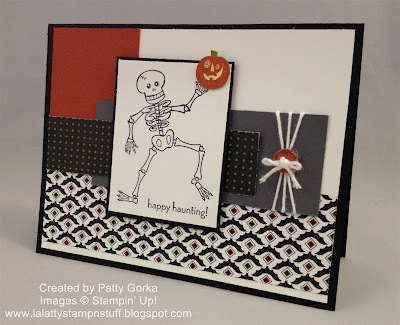 These are very nice cards Patty! I like them all & the layouts are great! TFS!! !